Our NYC adventures continue! Grab a cuppa and join me as we talk about tea. There’s nothing like a nice cup of tea in late afternoon, after the day’s work is done. And, as we’re discovering, our East Village neighborhood is loaded with places to drink all kinds of tea, from organic herbals to bubble tea to the real deal, as we found at Tea Drunk, a local establishment. Tea Drunk offers genuine teas, hand harvested from China. The menu is extensive and not cheap — fine tea ranks right up there with fine wine. With all the options available, we opted to do a tasting. 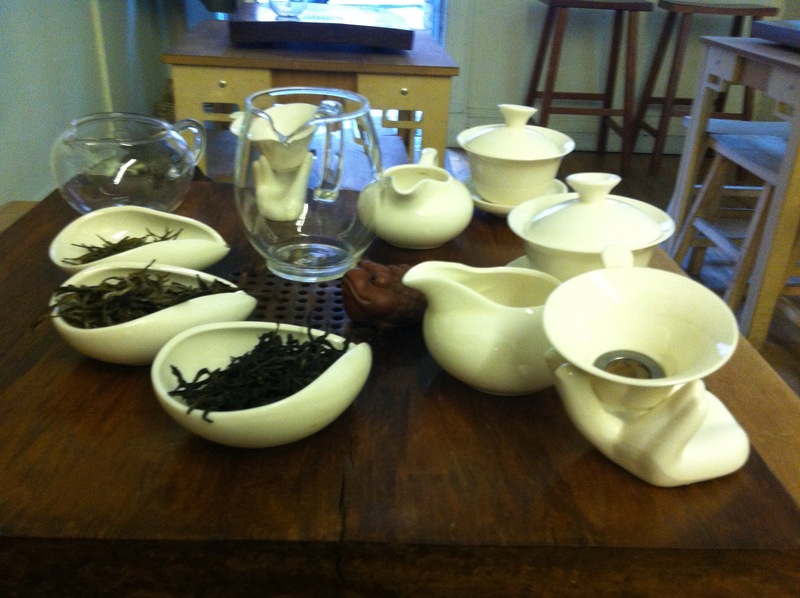 We selected the fall teas, which included a yellow, white, and oolong. The menu admonishes: no herbal teas here. Personally, I love herbals and drink them all the time, but I was eager to sample the genuine teas. We were each presented with three tiny cups. Our server poured boiling water into each of the teas; the first steep is discarded. We then sampled each of the teas. Periodically he would come around and do yet another steeping. With each one, the flavor of the tea awakened more and more. To steep the tea, he poured water in, let it sit for just a moment, and then strained it into little pitchers. I was surprised to find the teas full of flavor, even with the “instant” steeping. I asked what makes tea black, white, green, or yellow. He explained that the leaves are the same, but they are processed differently. Green tea is heated immediately upon harvest, making it the freshest of the teas. White tea is not heated at all, while the oolong is heated but undertakes several shakings to wake up its enzymes. By the end of the leisurely tasting we were relaxed yet happily buzzed from the caffeine (not great for sleep, but oh, well) and learned more about real tea. No doubt I will return to sample one tea at a time, to get to know them better! Nadine Galinsky Feldman is the author of The Foreign Language of Friends and the upcoming What She Knew, available March 2016. If you enjoy this blog, please consider purchasing a book or signing up for the newsletter to be kept informed of upcoming promotions and giveaways. Hmm, who would know that you would have to visit NYC to learn about tea. It would be delightful to explore the different tea shops to sample the tea. I drank my cup of green tea while reading your blog. Hopefully, your weather there is not as crazy as our rain and windstorm. You left at a good time. You won’t have to worry about watering your garden here at home. I’ve been reading about the weather out there! I knew it was supposed to be a rainy winter…we need it. A drought in Houston was the last straw for our living there, so I swore never to complain about rain. We’ve had some great weather here, in the 70s until just a few days ago, and now more seasonal. It was so much fun to find this shop. Though I’m going to blog about better-known NYC attractions, I want to find more of these unusual adventures and write about those as well. Wow, I didn’t know there was that much to tea. But as I don’t drink it, I wouldn’t. Glad you found a great tea room. I didn’t either…had no idea. I’m generally more of an herbal tea kind of gal, and we found a good spot to get that as well. This place was sort of spendy, so I won’t go there often, but it’s a fun special occasion kind of place. We used to have a place like that in Glasgow. Different rituals for each type of tea – I loved it, but obviously not enough other people did because it didn’t last long. Yours sounds like a real find. It really is a cool place. It’s been there a couple of years so far, so I guess it brings in enough business to keep going. It’s a date, Bella! I love me some high tea, and you’re high on my list of bloggers I’d love to meet.